Even a message from Frank isn't all that clear-cut: "Trust no one. The devil was once an angel." Is it a warning to Jessica or a confession as Frank's colleague, Detective Rikki Havens, suggests? When a body turns up, the identity of the victim only fuels the controversy. Good cops. Bad cops. Missing money. Undercover operations that may or may not have ended. Jessica and her friends soon become entangled in a web of secrets and lies that make it hard to know who's on which side of the law. 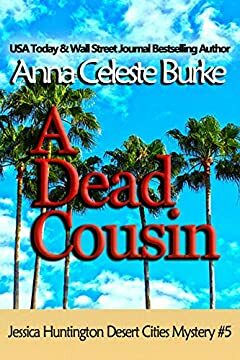 >>>Join Jessica and her "Cat Pack" as they search for Frank in A Dead Cousin, book 5 in the Jessica Huntington Desert Cities Mystery series by USA Today and Wall Street Journal bestselling author, Anna Celeste Burke!